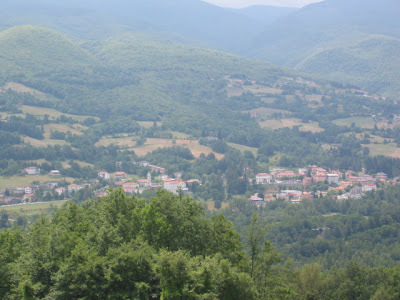 From Bargo Val di Taro we headed over the hills to Levanto. This was our second big hill. The views were great! 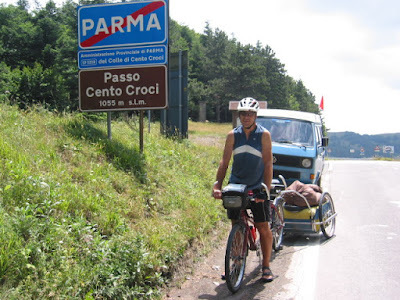 In all European countries we have been in cycling is a very common means of transport, but in Italy it is also a national pastime. Everyday we see lots of people kitted out on racing bikes doing training rides. The cool thing is they and also many motorists give us heaps of encouragement! Maybe because Mario Cipollini rode a Cannondale bike or because we are on a tandem? Anyway it is great! After reaching the top of Passo Cento Croci, we had a really big downhill, with lots of switchbacks - the trick here is to not overheat the brakes - which get extremely hot on the tandem (we don't have a drag brake, which are a nice feature on some tandems). Our solution is to manully adjust our trailer hub brakes so the drag all the way down the hill, at the bottom they are way to hot to touch! But after a few minutes they cool enough release them. 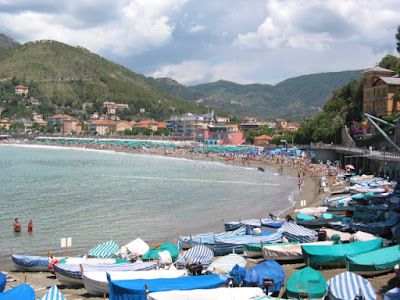 In Levanto the campground was packed, many Dutch and Germans. And during the night we had a huge thunderstorm and it was still raining in the morning - so we had to go and find a cafe with sky TV so we could watch the 3rd Lions test - Go Tana! Also we met the manager of the Hurricanes at the Levanto campground - talk about a small world. The first photo below is of a village we overlooked as we headed up to the pass. Second - finally we got to the top after 13km uphill. 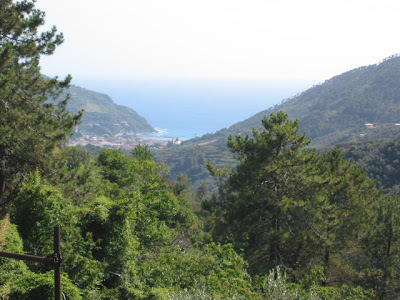 Third is of our destination - the seaside town of Levanto, which is at the Northern end of Cinque Terre. Finally the very very popular beach at Levanto.